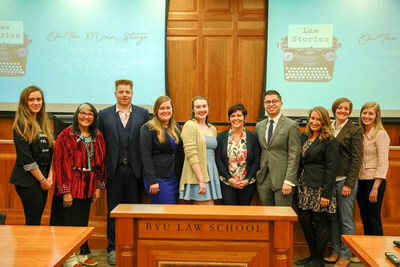 PROVO, Utah, March 18, 2019 /PRNewswire/ -- BYU Law, a leading national law school focused on innovation in the legal field, today announced the selected participants of BYU LawStories, a storytelling initiative open to law school students in the United States. Law school students across the country were asked to submit a nonfiction narrative of 1,000 to 1,500 words that tied together their life and the law. This inaugural initiative garnered 40 submissions from students at 28 different law schools from coast to coast. "Congratulations to these outstanding authors whose compelling stories illuminate the transcendent power of law in our daily lives," said Gordon Smith, Dean, BYU Law. "We believe initiatives like BYU LawStories can help further prepare students for their legal careers, and we are pleased to recognize these students in the inaugural BYU LawStories initiative." Selected storytellers received an expenses-paid trip to Brigham Young University's campus March 13–16 where they presented their nonfiction narrative stories tying together their life and law at BYU LawStories on the Mainstage, a public storytelling event. Before their presentations, participants received a half-day seminar on storytelling taught by Sam Payne, who hosts "The Apple Seed: Tellers and Stories" – a national radio show. At the conclusion of the seminar, participants recorded their stories for broadcast at state-of-the-art BYUradio studio. Founded in 1971, the J. Reuben Clark Law School (BYU Law) has grown into one of the nation's leading law schools – recognized for innovative research and teaching in social change, transactional design, entrepreneurship, corpus linguistics, criminal justice, and religious freedom. The Law School has more than 6,000 alumni serving in communities around the world. In its most recent rankings, SoFi ranked BYU Law as the #1 best-value U.S. law school in their 2017 Return on Education Law School Ranking. For more information, visit http://www.law.byu.edu/.